Portable compact computer desk made of laminated particleboard and fixed with mental steel wire. Small space needed, you could put it in your office, kitchen, study room, home, library, work as a computer desk,gaming desk,study desk. Great for business men, women,students and kids. Simple and modern design home office desk,easy and quick to assemble. This minimalist computer desk offer you a personal and enjoyable space. 3 tier shelves can hold up your books,CDs,plants,pens and other home accessories. Easy to assemble, it also can be folded in the corner if you don't use it and easy to move. If you have any questions about products, please feel free to contact us, our professional staff will be always ready for your needs. Material:made of laminated particleboard, fixed with sturdy black metal wire. 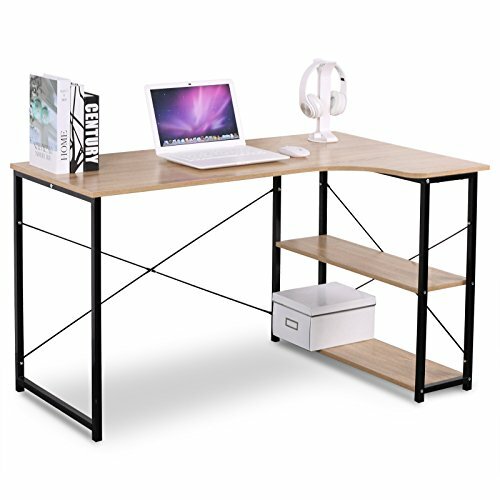 Computer Desk Size:47.3"*29.1"*28.2".Enough desk surface to put books and computers as a corner desk, save your space. Workable: can be used as business office workstation, meeting desk, home desk, computer desk,gaming notebook desk,study desk for kids etc. Durable:Load bearing of the desktop is 150bls, load bearing of each shelf is 60bls. Quick and Easy to Assemble:with all accessories and clearly assembly instruction, the awesome computer desk will very easy to install. If you have any questions about this product by WOLTU, contact us by completing and submitting the form below. If you are looking for a specif part number, please include it with your message.